‘Wherefore, in the honour of God, let me not be forgotten, but with diligence tender my pains, as I shall be ever your beadwoman, and surely deserve your goodness, if God make me able, whom I beseech to preserve you ever in much worship.’ Thus wrote the English nun Margaret Vernon in a letter of 1528 to Thomas Cromwell. Twenty-one letters, dating between 1522 and 1538, from this remarkable abbess to her increasingly powerful patron are known to have survived, and now a catalogue with a calendar compiled by Professor Mary J. Erler during the course of research for her publication Reading and Writing During the Dissolution: Monks, Friars, and Nuns 1530–1558 (Cambridge University Press, 2013) is available in EMLO. Margaret Vernon held the position of superior in four religious houses in the south of England: Sopwell Priory; St Mary de Pré (these were both in St Albans, Hertfordshire); and, consecutively, Little Marlow (Buckinghamshire) and Malling Abbey (Kent). Her letters, the manuscript originals of which may be found in either the State Papers at The National Archives, or MS Cotton at the British Library, span the career of a woman forced to navigate times of unprecedented religious turmoil and upheaval. 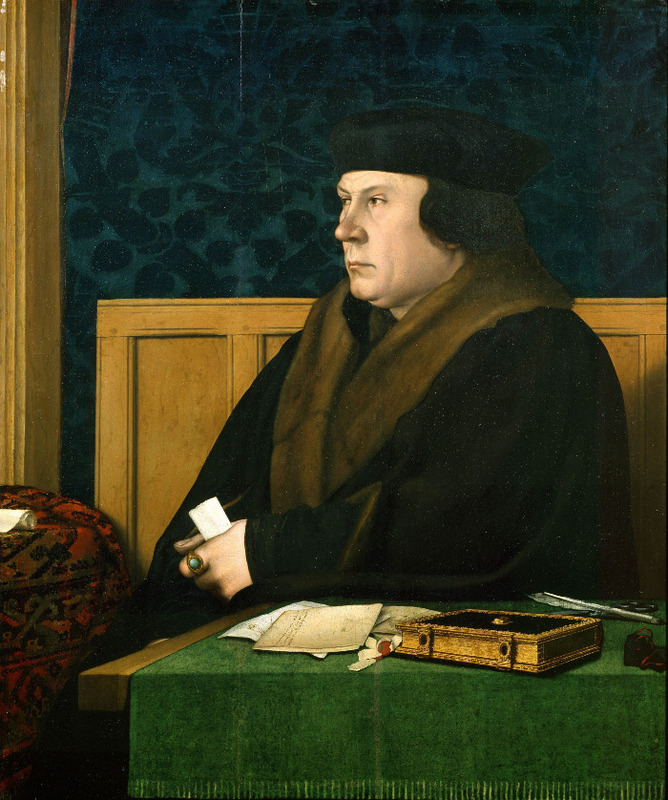 They reveal a lengthy relationship forged with Cromwell, beginning in the early 1520s before his meteoric rise while he was in the service of Cardinal Wolsey. During these years, Cromwell seems to have acted as financial adviser to Vernon, who was at that point head of Little Marlow. Some of the letters chart Vernon’s unsuccessful negotiations to become prioress of St Helen’s Bishopsgate, London, the position she had been promised by Wolsey. Other letters cover the period during which Cromwell entrusted his only son Gregory to Vernon for his early schooling. And a number of the letters convey the desperation of the abbess at the imminent closure of both Little Marlow and, subsequently, Malling. Remarkably, in 1538, when the dissolution of the latter seemed unavoidable, Vernon requested permission to sell one of the manor houses associated with the priory, thereby to secure a pension for herself and her nuns. This was not to be, however. Vernon and her community were duly laicized, and the pension she received — less than requested — may be traced until 1546, six years after the execution of her once all-powerful patron. Those who have followed EMLO over the past summer will know that, following the exciting launch of WEMLO, the resource and discussion forum for all early modern women’s correspondence, they will be able to search this abbess’s letters alongside the growing body of women’s correspondence within EMLO. For those who missed the launch, or who are visiting the union catalogue for the first time, we urge you to explore! Meanwhile, behind the scenes, metadata for increasing numbers of new correspondences are in preparation at EMLO and we’re truly delighted to reveal that the imminent addition of catalogues for a selection of key significant and powerful sixteenth-century women will allow Margaret Vernon to be viewed in a richer context still. This entry was posted in Uncategorized on October 30, 2016 by Miranda Lewis. The catalogue published in EMLO this week, that of the diplomat Robert Beale, takes us straight to the heart of Elizabethan political and administrative circles. As Clerk to the Privy Council — a position which he held for almost three decades — Beale was witness to a succession of extraordinary events in turbulent times: he played a significant role in the misfortunes and fate of Mary, Queen of Scots, and he conducted a series of high-level diplomatic missions to the Low Countries and to Germany. This calendar of Beale’s correspondence is made up of one-hundred-and-one items in the care of the University of Aberdeen. 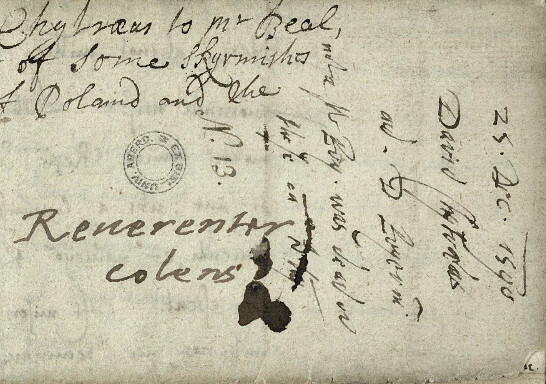 Spanning the entire second half of the sixteenth century, many of the letters relate to international and domestic affairs of state; others bear testament, however, to Beale’s own personal connections and to his scholarly bent: he corresponded with, for example, David Chytraeus, the Lutheran Professor of Greek at the University of Rostock, and with André Wechel, the reforming printer who was based first in Paris and then — following the Massacre of St Bartholemew in 1572 — in Frankfurt. At EMLO we are truly delighted to be working with Dr Andrew Gordon, the scholar heading the Robert Beale project, and with the Special Collections Centre at the University of Aberdeen. The Library has generously made available digital images of the manuscripts, and users will find links to these from each letter record in EMLO. Dr Gordon has included metadata from the earlier researches of James D. George (1906–1977), a former secretary of Marischal College, who prepared a handlist of items in the Beale papers and made partial transcriptions and notes on the majority of these. The Beale papers were recorded initially at King’s College in an inventory of 1771. Although it is not known how they entered the collections, it seems likely they formed part of a donation from Dr James Fraser (1645–1731) a book dealer and supplier to the libraries of the later Stuarts, who made significant benefactions to King’s College in the decades preceding his death. Work on the Robert Beale project is ongoing and to facilitate research the calendar created during this initial stage is being released sooner rather than later. Significant additions, together with revisions, made in subsequent phases will be uploaded as they become available. Increasingly EMLO is working in partnership with libraries and special collections. Indeed, this week sees the inaugural session of an exciting pilot scheme being run with Oxford’s Bodleian Libraries to bring together students, curators, digital experts, and original manuscripts. The aim is to produce student-curated catalogues of hitherto unpublished letters. Undergraduates and postgraduates are invited to attend standalone sessions in a series of workshops at the Weston Library. Over the course of a day, students will work in pairs to collate the metadata, and produce transcriptions, which will be published in EMLO under the collective title ‘Bodleian Student Editions’. Students will be credited in full for their work and each session, which will take place in the Weston’s Centre for Digital Scholarship, will focus on a selection of early modern letters from Special Collections and will include guidance on such issues as handling manuscripts; paleography; drafting a transcript; proofreading; collating metadata; and preparing a catalogue in EMLO. We hope very much these workshops will prove productive and helpful for students and staff alike. Students from any discipline may apply by emailing Mike Webb, the Curator of Early Modern Manuscripts [mike.webb@bodleian.ox.ac.uk]. This entry was posted in Uncategorized on October 16, 2016 by Miranda Lewis. In these troubled times of trenches, walls, and drawbridges, we could not be more delighted to announce the arrival in EMLO of Pierre Bayle, one of the foremost citizens of early modern Europe’s Republic of Letters. Bayle resides at the very heart of this early modern community that corresponded and networked irrespective of political border or scholarly allegiance, and today we — together with our own international network of twenty-first century historians — remain firmly committed to its reassembly. ‘Nouvelles de la République des Lettres’, no. 1 (Amsterdam: 1684; source of image: Wikimedia Commons). 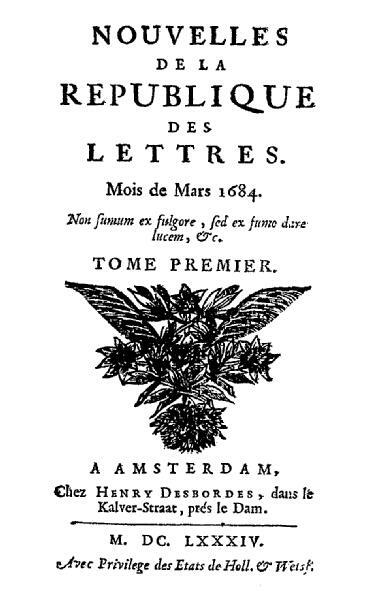 A Huguenot refugee who moved to Rotterdam shortly before the Revocation of the Edict of Nantes, Bayle published one of the first literary periodicals, the Nouvelles de la république des lettres (1684–1687); he compiled the vast and remarkable Dictionnaire Historique et Critique in two editions of 1697 and 1702; and in his Commentaire philosophique (1686–1688) he issued a plea for religious tolerance based on moral rationalism. A critical edition of his extensive correspondence is being published in print and online. The Voltaire Foundation, our esteemed partner here at the University of Oxford, is publisher of the multi-volumed hard-copy edition (under the direction of Antony McKenna and the late Elisabeth Labrousse), and publication of the impressive thirteenth volume (containing the correspondence from the years 1703 to 1706) has just been celebrated. The digital edition of the correspondence — overseen also by Professor McKenna — is hosted at the Université Jean Monnet Saint-Etienne, and it is on this interface that the letters may be consulted together with images of the manuscripts. In EMLO you will find at present a calendar of the metadata of the first seven volumes of Bayle’s letters, each record of which provides a detailed reference to the hard-copy edition and offers a link to the digital copy mounted at Saint-Étienne. Two incremental extensions to the calendar will be added over the coming months until the total of 1,791 letters is in place. But of course, these letters are the ones that that have survived. As Professor McKenna explains in his thorough and informative introduction to the catalogue, Bayle’s ‘surviving letters bear witness to a great number of letters that have not’. For example, the two hundred extant letters dated prior to October 1681 refer to more than 400 others that have been lost. Consideration of these missing letters leads to Bayle’s network becoming ‘much more complex and significantly more dense’, Professor McKenna oberves. We will be working together in the coming months to explore this shadow archive and the extent of the networks that held Bayle at their heart. Keep watching: this drawbridge is firmly down and there is a great deal more to come! This entry was posted in Uncategorized on October 6, 2016 by Miranda Lewis.